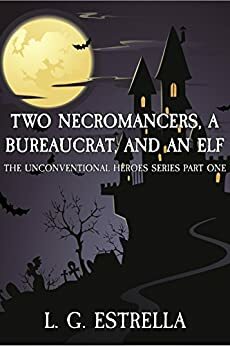 Two Necromancers, a Bureaucrat, and an Elf, by L.G. Estrella – This author has written quite a bit of self-published material, much of it in the humorous fantasy and science fiction vein, but this is the first one I’ve read. It was pretty good, if rather short, but there are sequels I haven’t read yet. The necromancer Timmy Bolton and his eager young assistant are seeking a pardon, and in order to get it they have to assist their country to prepare for war. Their first mission is to seek assistance from a renegade elf, with a bureaucrat accompanying them to make sure they fulfill their part of the deal. The bureaucrat has some magic himself, being able to store and conjure items. It’s pretty inventive, with its zombie chimeras, ninja rats, and shovel of death; but a bit thin on plot and world-building. I’ll probably still read some more by the author, though. 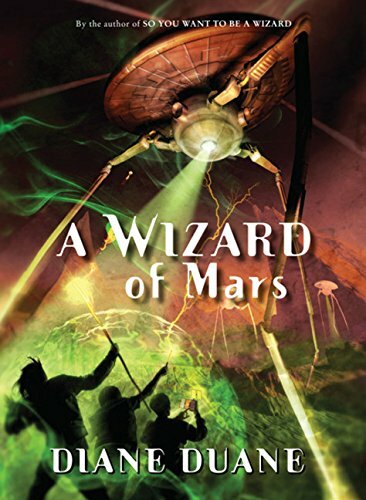 A Wizard of Mars, by Diane Duane – The ninth book in the Young Wizards series, which has previously brought its protagonists to distant galaxies as well as many locations on Earth, here focuses on Mars and its fascination for humans. There are a lot of references to previous fictional works that feature Mars, including War of the Worlds, Edgar Rice Burroughs’ John Carter series, and even Marvin the Martian. Nita, Kit, and their relatives and associates eventually find out that the planet was once inhabited by two warring tribes. And one of the members of this ancient species claims to have a connection to Kit. Really, he’s pretty obnoxious in this book, but there is a reason for it. There are some interesting new characters as well, including the tomato-loving saurian Species Archivist Mamvish. 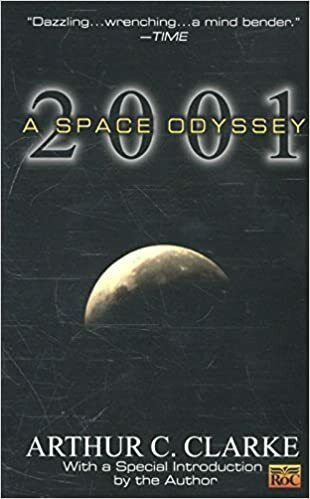 2001: A Space Odyssey, by Arthur C. Clarke – I remember trying to read this a long time ago, before I’d seen the movie, and I didn’t get very far. I can’t say I recall why this was the case, but I’ve finally finished it. An introduction by the author talks about how he was working on the novel at the same time the screenplay was being developed, and the latter cut out Saturn because it wouldn’t have looked right on film. I have to say that, as impressive as the movie looked, the novel had much better pacing. It also gave explanations for some of the weirder elements, including why HAL went crazy and what the ending signified. It’s interesting that the book and movie were both released the same year as Erich von Däniken’s Chariots of the Gods?, which also proposes that aliens influenced the development of humanity. The difference is that some people take that book seriously, even though his ideas make less sense and are much more insulting. Clarke had developed the basic idea in a short story in 1948, and other authors had addressed the topic before that. There’s also kind of a bittersweet feeling in reading old stories about space exploration, and how we still haven’t accomplished a lot of what Clarke predicted even though 2001 has come and gone. Not that I think space exploration should be a priority in modern society, just that it reflects my feeling on how optimism about the future has largely died out. Uncle Scrooge and Donald Duck, Volume 1: The Son of the Sun, by Don Rosa – I’d read the second volume already, but it’s not like the order is particularly important. This one has Rosa’s earliest stories set in the Duck universe, with a rougher art style than what he’d later use, but still a lot of background details and references back to Carl Barks stories. Rosa saw his work as Barks-consistent, so even though the character of Donald Duck was presumably created to be a non-aging cartoon character, Rosa prefers to stick to the time period in which Barks wrote, as otherwise Scrooge would have been well over one hundred years old. I can respect the adherence to continuity; I like plenty of media that operate on a sliding time scale where the characters either don’t age or age irregularly, but they do lose a certain amount of verisimilitude. Rosa also paid close attention to such details as what kind of car Donald drives (it’s actually assembled from parts of several different makes). And for all the continuity obsession, Rosa’s stories are still clever and funny. These stories have Scrooge and Flintheart Glomgold competing for lost Incan treasure, Donald’s nephews figuring out a way to make Gladstone Gander’s luck work against him (although it still doesn’t completely work out), the Beagle Boys trying to steal Scrooge’s money with ray guns that nullify friction and inertia, and Scrooge returns to the Klondike to retrieve his glacier-bound sled. This entry was posted in Book Reviews, Cartoons, Conspiracy Theories, Humor, Magic and tagged 2001 a space odyssey, a wizard of mars, arthur c. clarke, carl barks, chariots of the gods, diane duane, don rosa, donald duck, elves, erich von daniken, flintheart glomgold, gladstone gander, l.g. estrella, mars, scrooge mcduck, the son of the sun, two necromancers a bureaucrat and an elf, young wizards series. Bookmark the permalink. I once picked up a collection of the first three Young Wizards books and reread So You Want to Be a Wizard, which my dad had read to me and my siblings when we were kids. I was a little surprised to realize that the author was the same Diane Duane who I recognized as a writer of Star Trek novels. I also never knew there were sequels. Though I understood certain parts of SYWTBAW better (like figuring out that two of the adult characters were probably meant to be a gay couple) the internal logic of that world seemed to make more sense to me when I was a kid. I never managed to read past the second book, which I didn’t like all that much. I’ve always admired Carl Barks’, and by extension, Don Rosa’s stuff, though I haven’t read as much of it as I’d like to. Having watched the first new episodes of the rebooted DuckTales, I like a lot of what they’re doing, but can’t help wishing they could be more faithful to the comics. A sense of optimism regarding the future has always been one of the big draws of science fiction for me. I used to read a book by Arthur C. Clark or look at some beautiful painting of space exploration by Robert McCall and be instilled with this hope about where we’re heading as a species. But given the way things are right now, it’s especially hard to imagine the human race getting its s*** together and making it off the planet before we blow ourselves up and/or completely ruin the environment. Gary Lockwood, on the commentary track for 2001: A Space Odyssey, actually expressed the view that humanity probably only had another century left (and this was recorded a number of years back, so god knows what he thinks now). Sadly, as much as I hate to admit it, that pessimistic attitude doesn’t feel entirely unjustified, but I’d certainly like to think he’s wrong and that we can get things back on track. I haven’t yet watched the DuckTales reboot, although I’d like to. I did like the original when it was on, but now that I’ve read some of the comics, I think they often work better. A lot of Clarke’s work came out of the Cold War, and there was plenty of reason to be pessimistic then as well. And some visions of the future certainly were. But I still think that society in general is rather less positive in outlook, which is why we don’t have things like World’s Fairs anymore.